“I became familiar with TM two years before I learned the wonderful technique. I used to converse with my father and grandmother about meditative practices. Both of them meditated happily for roughly two years (the perfect time to notice the many benefits and life improvements that will start to come). They stopped temporarily for one reason or another (my dad’s excuse, comically, being having my twin and I). Later, after I had found out about TM, I watched many talks of Russell Brand talking about the many benefits of it and the impact that it has had on his daily life. I like to thank Russell for inspiring me to look further into TM and giving me the incentive. This sparked a greater interest in TM and I took it upon myself to read a book on the subject my grandmother was kind enough to lend me. It was a fascinating and brilliant book characterising with great clarity the many benefits of TM, it’s mechanism of action, its history and plethora of scientific fortification. Halfway through and enthused by the book I decided to experiment with meditation; eager to start practising with some sort of technique I haphazardly devised myself. It didn’t last long since I didn’t know if the mantra I was using was suited to the practicality of an integrated lifestyle. I understand now that the mantra that TM gives is suitable for the more modern lifestyle. With other mantras they may possibly lead you unintentionally to a monastic and reclusive lifestyle. After finishing the book I was completely dynamised and motivated by the excitement of learning to transcend and I went off and did some research to find the nearest TM teacher to me, who turned out to be a delightful, amicable, patient and warm hearted true gentleman. I learned the technique over a four-day period. I have been practising for just over a half-a-year now and can say I am already seeing the benefits, as I can’t go a day without meditating – otherwise I will simply feel as though I am missing out a major part of the day. 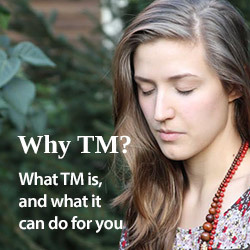 TM has played a major role in reducing the stress of my daily life. Stress for me is; completing my college assignments on time and ensuring I get the necessary amount of revision done for maths; exams, and worrying about future plans and decisions. TM has enabled me to live a fuller, richer, more composed, prosperous and integrated life with a reduction and eventually hopefully a complete eradication of stress. My personal experience with TM has brought me a greater sense of wellbeing and reassurance into my life that everything will be okay in the future. In my weekend job I have increased spontaneity in work, more efficiency and a greater connection with the customers I serve. With my piano practice I am amazed at how fast I pick up and learn new pieces, with the aid of my grandmother. There is also a deeper connection and emotional touch when playing. Last but not least, my studies – I am learning faster, completing assignments quicker and gaining a deeper understanding of topics when learning. If there is one thing I regretted most about learning TM it would have to be not learning it at a younger age or earlier in my life, as there isn’t a day that goes by that I don’t have a deeply seeded sense of gratefulness and appreciation (particularly to my teacher) for the technique and to Maharishi for making such a splendid practice available for the benefit of the human race. 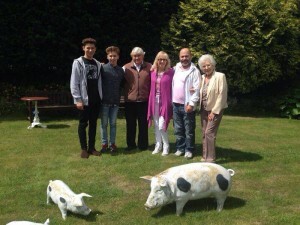 Most of all I have experienced the greater sense of contentment that it has brought to our family as a whole, bringing us closer together. I can honestly say it has been one of the best decisions I have made.